Be crowned the first-ever DraftKings Sports Betting National Champion. You can place your bets and watch the games all day long in our New Jersey VIP Sportsbook Venue. But with one of the greatest cities on Earth just minutes away, come and go as you please while taking in all The Big Apple has to offer. The Sports Betting National Championship will take place over three days during the NFL DIvisional Weekend. Don't wait for online sports betting to come to your state — come to New Jersey and get in on the action. check out our rules section. Purchase your spot now for $10,000 by contacting a SBNC Host at VIP@DraftKings.com Book a room with us or find your own accommodations. You can play anywhere in New Jersey! Win your $10,000 Tournament entry. Guarantee entry now for $10,000. Email us at VIP@DraftKings.com. Book your own accommodations. You can play anywhere in New Jersey. Your $10,000 Buy-In includes your $5,000 bankroll and $5,000 entry in the SBNC Tournament. 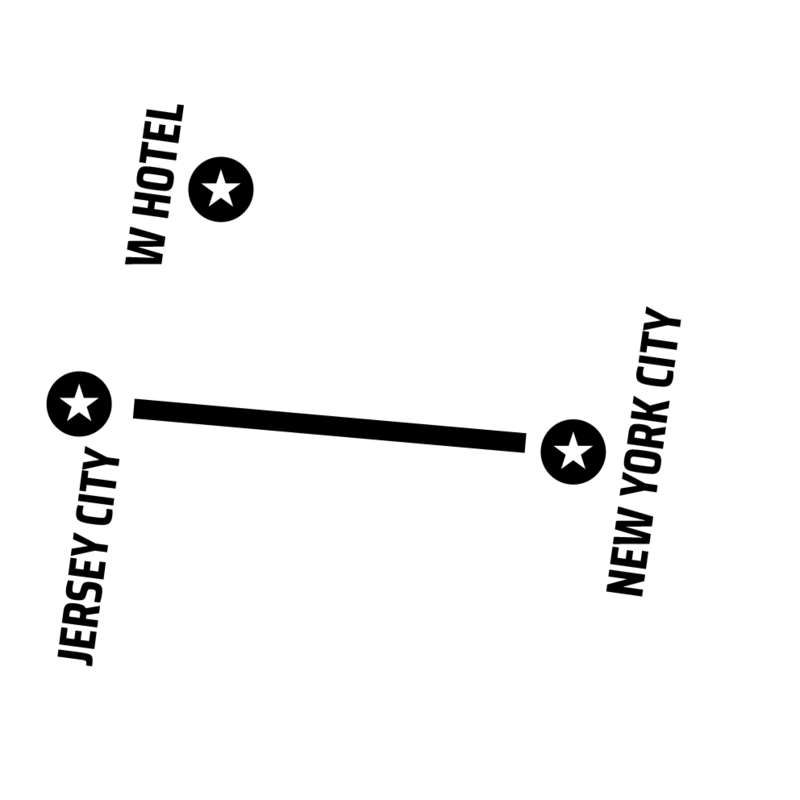 Need accommodations in New Jersey or nearby in New York City? Our event team can assist you with booking at one of our hotels. From now until January 8, compete in satellites and qualifiers to win your entry for as little as 10 cents. Follow us for contests and giveaways awarding SBNC entries. Here’s everything you need to know about the Championship weekend. Prizes above based on 531 or fewer entries; to see full pay-out tables, click here. Players must place a total of $1,000 in bets by the close of betting on Saturday night and $2,000 across Sunday’s NFL games to be eligible to win leaderboard prizes. Players with the highest bankrolls at the end of the tournament will share the leaderboard prizes. All players take home their final bankroll at the end of the tournament. Only 1 entry allowed per player. Please email VIP@draftkings.com for more information on buying into the 2019 Sports Betting National Championship. On Friday and Saturday bets on all sports are allowed. Those events must be scheduled to begin before 1am Sunday and be graded by 8am EST Sunday to be eligible for scoring. On Sunday bets are only allowed on markets for the two NFL divisional round football games. The results of any wagers placed on or including sporting events on Sunday other than those 2 games will not count towards your score or minimum wagering requirements. HOW DOES THE MINIMUM BET RULE WORK? To be eligible for leaderboard prizes you must place a minimum of $1,000 in bets on the outcome of any sporting event in the DK sportsbook that is live between noon Friday and the 1am on Sunday. On Sunday, you must place a minimum of $2,000 in total wagers on markets for the two NFL divisional round football games. Parlays which include bets on the Sunday NFL games will count towards your Sunday minimum. HOW WILL THE LEADERBOARD WORK? Starting on Saturday with the kickoff of the first NFL divisional round game the live leaderboard will be published including the current score for each player as well as their live, upcoming, and graded bets. The $50,000 leaderboard prize for the highest score going into Sunday will be calculated based on the leaderboard scores at 8am EST on Sunday. WHAT HOURS ARE BETTING OPEN? DO I HAVE TO BE IN NJ THE WHOLE TIME? No, while you must be in NJ to bet and must check in with DraftKings once during scheduled hours at the player hotel or event location prior to 1pm on Sunday, other than that you are free to spend the rest of your time as you please. CAN I USE THE CASH-OUT FEATURE? Yes, you may cash out a bet at any time during which betting hours are open and where cash out is available for a bet. How is my $10k Buy-In broken up? Your $10k buy-in gets you your $5,000 Cash Bankroll and $4,700 SBNC Tournament Entry Fee. $300 is retained by DraftKings Sportsbook as the tournament administration fee. When I buy in to the event DO I HAVE TO STAY IN NJ OR USE A DRAFTKINGS HOTEL? Betting limits for all competitors will be same at all points in time although maximum bets may change as the start time of an event approaches and vary by sport and market. Submitted requests for a bet in excess of the maximum bet will be denied. Betting limits are not publicly posted but will not limit competitors ability to wager in major sport markets. The state of New Jersey requires us to withhold taxes on wins of $5,000 or more where the odds of the bet were 300x or more. As a result, competitors who have such a win will have these funds withheld from their balance. However, the full winning amount, before withholding, will be included in their final score. Example: Rich places a $10 parlay that pays out $10,000 resulting in a withholding of $2,400. After continuing to bet all weekend his final balance in his SBNC account on Sunday is $20,000 and his final leaderboard score is $22,400. Can I work together with other competitors? DraftKings Sportsbook Terms explicitly forbids Collusion or any form of syndicate play. No competitor may participate in such a way as to intentionally benefit another competitor or to incentivize actions by other competitors that benefit them. Any competitor(s) found to have engaged in such behavior will be subject to removal from the tournament by the tournament director. WHAT IF I WANT TO BET ON SOMETHING OUTSIDE OF THE TOURNAMENT? Your regular DK Sportsbook account will be available to you at all times, even when betting is closed in the SBNC. Simply log in and bet as you normally would. WHAT HAPPENS TO MY MONEY ONCE THE EVENT IS OVER? At the completion of the SBNC, once scores have been tabulated and confirmed, leaderboard prizes will be placed in your account. Once that is complete all funds in your SBNC tournament account will be transferred to your main DK account and will be free for withdrawal. Players are only allowed one entry into the 3-Day 2019 Sports Betting National Championship. There is a maximum of 600 entries in the event. At conclusion of the Championship, the bankroll in the player’s tournament account, as well as any leaderboard prizes, will be kept by the player. Betting Limits: All users in the contest will be subject to the same betting limits across eligible events. Minimum play requirements for SBNC prize pool eligibility: Players must place a minimum of $1,000 in total wagers between Friday and Saturday and a minimum of $2,000 in total wagers on Sunday in order to be eligible for leaderboard prizes, regardless of the final score. If a player doesn’t meet wagering requirements they will still receive the value of bankroll at the conclusion of the event. On Friday and Saturday, eligible wagers will be any sport (or combination of sports via parlay) or wager in the DraftKings Sportsbook app that begins at or after noon Friday and whose event(s) conclude before 8am EST on Sunday. On Sunday, eligible wagers will be on markets for the two scheduled NFL Divisional Round Playoff Games only. Wagering will be unavailable between 1am and 8am each day. All bet types, live betting and cash-outs are eligible wagers for players. No wagers will be allowed after the kickoff of the second game on Sunday. The contest scoring is final once grading of the 2nd and final NFL playoff game on Sunday is complete and any adjustments per contest rules have been applied. Wagers made outside the SBNC tournament account or using DraftKings Sportsbook account funds will not count — only wagers using the SBNC tournament dollars are eligible. IMPORTANT! PLEASE CAREFULLY READ THESE PROMOTION RULES (hereinafter, "Promotion Rules") BEFORE ENTERING THE 2019 DRAFTKINGS SPORTS BETTING NATIONAL CHAMPIONSHIP AS THESE RULES AFFECT YOUR LEGAL RIGHTS AND OBLIGATIONS. DraftKings Sportsbook is pleased to announce an exciting new promotion, the 2019 DraftKings Sports Betting National Championship (hereinafter, the "SBNC Promotion" or “SBNC”), exclusively for DraftKings Sportsbook Players (“Contestants”). SBNC Contestants will have the opportunity to win the Prize (defined below). To qualify for the SBNC, Contestants have two (2) entry options. 1. In the first entry option, Contestants can win a “Ticket” to the SBNC Promotion (“Ticket Winner”) by playing in a DraftKings Daily Fantasy Sports qualifier contest (a “Qualifier”), the top prize of such contest being a Ticket for free entry to the SBNC plus airfare and lodging. Qualifiers will be run from time to time in the sole discretion of DraftKings up to and through January 9th, 2019. The Qualifier Ticket Winners will win the following: a trip for two (2) to Jersey City, New Jersey (hereinafter, "NJ"); a $1,000 cash credit to the winner’s DraftKings’ player account for transportation to/from the SBNC; and accommodations in downtown NJ for three (3) nights (arriving on January 11, 2019 and departing on January 14, 2019) (collectively, the “Qualifier Prize”). The approximate retail value of the Qualifier Prize is $12,000.00. 2. In the Second entry option, a Contestant can “buy-in” to the SBNC by buying a Ticket for TEN THOUSAND DOLLARS ($10,000) by no later than January 12, 2019 at 4pm EST. Those Contestants who buy-in to the SBNC shall not receive any travel or hotel accommodations, and shall only receive the Ticket for entry to the SBNC. Buy-in details are located on the SBNC promotional page located here - www. draftkings.com/lp/sports-betting-national-championship. In addition, DraftKings may, from time to time, elect to give away Tickets to the SBNC via promotions, giveaways, or other contests in DraftKings’ sole discretion from time to time. $5,000 will be used as the player’s bankroll (earmarked with special DKSB Dollars) for wagering during the tournament and the bankroll and any winnings derived from it will be credited to the user account at the completion of the event. $4,700 will be used to make up the prize pool (“Prize Pool”) for the tournament portion of the event and will be distributed to the top Final Score totals at the end of the SBNC in accordance with the payout tables located on the SBNC promotional page - www. draftkings.com/lp/sports-betting-national-championship. $300 will be retained by DraftKings Sportsbook (“DKSB”) as an administrative fee for the operation of the event. All Qualifier entrants and Contestants in the SBNC Promotion must be at least 21 years of age as of January 11, 2019, have a valid United States Social Security Number, are not self-excluded from online gaming in the state of NJ, are not excluded from play on the DraftKings Sportsbook, and are able to physically travel to the State of New Jersey (and possess all documentation needed to travel to NJ) in order to play in the SBNC. All Contestants who fail to meet such criteria may have their Ticket revoked without reimbursement. On Friday and Saturday Contestants can wager on any sport (or combination of sports via parlay) or wager in the DKSB that is live between 12:00pm EST Friday January 11th and 1am Sunday January 13th and whose event(s) are graded by 8am EST on Sunday January 13th. Wagering will be unavailable from 1am EST to 8am EST during each day of the SBNC Promotion Dates. WAGERS ON ANY OTHER GAME TYPES OR DURING THE TIMEFRAMES NOT OUTLINED HEREIN SHALL NOT COUNT TOWARDS A CONTESTANTS SCORE FOR PURPOSES OF THE SBNC PROMOTION. DraftKings will make every attempt to identify and notify contestants of any ineligible wagers and provide the contestant with an option to cancel that wager. Contestants who benefit from or refuse to cancel ineligible wagers may receive a score of 0 at the final determination of the tournament director. All bet types, live betting, and cash outs are eligible wagers for players. No wagers will be allowed after the kickoff of the second NFL Divisional Round playoff game on Sunday January 13th. Accounts used for the Sports Betting National Championship will not be eligible for any promotional offers including but not limited to Odds Boosts, Free Bets, Refer a Friend, Insurance Promotions. On detection, bets placed on any promotional offer will be voided and the wager will be returned to the customer. All users will be subject to the same limits on any given bet a given point in time. Any request submitted by a user to accept a wager in excess of that maximum wager will be rejected. In the event that a requested wager is inadvertently accepted in excess of offered maximum that excess wager will be voided and the wager will be returned to the customer. The contest scoring is final once grading of final NFL game on Sunday January 13th is complete and any scoring adjustments per contest rules have been applied. Wagers made outside the DKSB product, or using DKSB general funds will not count, only wagers using the SBNC dollars are eligible. • At conclusion of the SBNC Promotion, the bankroll in the Contestant’s tournament account and any Leaderboard Prizes will be deposited in the Contestant’s cash balance on the DKSB. • Minimum play requirements for SBNC Prize Pool Eligibility: Customers must place a minimum of $1,000 in wagers between Friday and Saturday and a minimum of $2,000 in wagers (or their entire remaining balance, whichever is less) on Sunday in order to be eligible for leaderboard prizes, regardless of the final score. If a player does not meet wagering requirements they retain any remaining funds in the Bankroll but are not eligible for the Prize (defined below). All Contestants must be physically present in the State of New Jersey during the SBNC Promotion Dates to wager on the DKSB, and check-in at the official reporters table located either at the SBNC event or the official SBNC hotel with a DraftKings employee by 1pm EST on Sunday, January 13th. Contestants who do not check in may be disqualified from the SBNC by DraftKings in DraftKings’ sole discretion. • The winner of the SBNC Promotion shall be the Contestant with the highest total Final Score) at the conclusion of the NFL games on Sunday (the “Winner”). Final Score shall be calculated as Contestants’ SBNC bankroll total, plus any applicable taxes withheld, less any ineligible wagers. • The Prize Pool will be based on the number of Contestants with all money reserved for the Prize Pool ($4,700 for each Contestant entered) guaranteed to be paid out. There is no maximum number of Contestants who may enter the SBNC, however, there will be a minimum guaranteed amount for the Prize Pool of $2.5 Million and a first place prize of ONE MILLION DOLLARS to the Winner (the “Prize”). The value of the Prize shall increase according to the payout table if there are more than 531 Contestants into the SBNC. The number of Contestants shall be capped at 600. • Any user who does not meet the minimum wagering requirements will receive a score of 0. • DKSB shall also offer a “Leaderboard Prize” of $50,000 to the Contestant in first place (the then-current high score at of 8am EST on Sunday January 13) prior to the beginning of the NFL Divisional Round playoff games on Sunday . Leaderboard Prizes shall not count towards a user’s Final Score for purposes of this Promotion. The best interest of the tournament and fairness are top priorities in decision-making. Unusual circumstances occasionally dictate that common-sense decisions in the interest of fairness take priority over technical rules. All tournament director decisions are final. If one or more DraftKings Players tie for a Ticket in a Qualifier, there will be a playoff promotion between the tied DraftKings DFS Players, as solely determined by DraftKings, to determine the winner of the Ticket to the SBNC. Every effort will be made to provide a playoff in the sport which the tie took place in. However, in the event that there are no slates of games for that sport available between the date of the tie and January 6th, 2019, DraftKings at its sole discretion may select another sport in which to run the playoff contest. In the event of a tie for any position in the SBNC Promotion prizes shall be divided evenly amongst the Contestants that have tied. For example, if two Contestants tie for first place, each tied Contestant shall receive one half of both the first place prize and the second place prize. In the event of a tie for the $50k Leaderboard Prize awarded on Sunday the prize shall be divided evenly amongst the Contestants that have tied for the top score. Once a player has accumulated one (1) entries to the SBNC Promotion they are no longer allowed to win entries in SBNC Promotion qualifier promotions. If a player chooses to play in additional SBNC Qualifiers after they have won their first entry to SBNC and they happen to win an additional qualifier, they will receive $0 for their additional entry and the ticket will be awarded to second place. If a player wins multiple qualifier promotions that were live at the time their first entry was accumulated, they will receive the cash value of their additional qualifiers. First degree relatives living in the same household are subject to the same max entry cap for the SBNC. For example, a husband and wife with separate usernames can only have one combined entry to the SBNC. 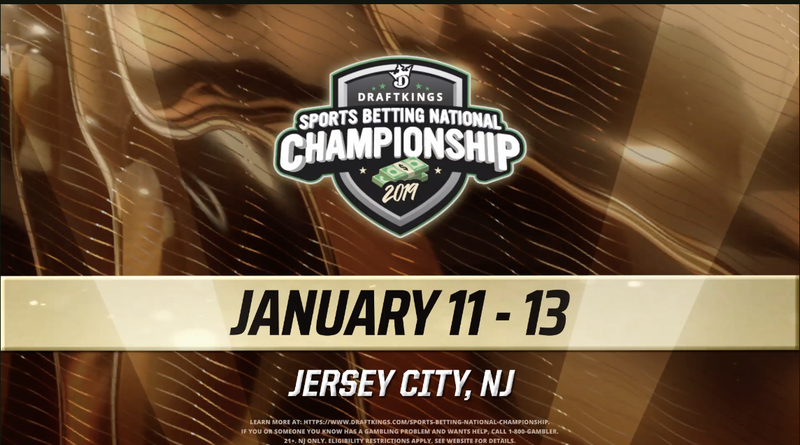 All Qualifier entrants and Contestants in the SBNC Promotion must be: at least 21 years of age as of January 9, 2019, have a valid United States Social Security Number, are not self-excluded from online gaming in the state of NJ or are excluded from play on the DraftKings Sportsbook and be able to physically travel to the State of New Jersey (and possess all documentation needed to travel to NJ) in order to play in the SBNC. All Contestants who fail to meet such criteria may have their Ticket revoked without reimbursement. Schedule, reserve and provide for your own travel arrangements to and from New Jersey for the Promotion. In the event a finalist or winner of a Prize is not able to meet the Requirements for claiming the Prize, such finalist or winner, as the case may be, shall not be entitled to the Prize, or any other prize, compensation or monetary value whatsoever, and DraftKings will have no further obligation to the finalist or winner, as applicable. The player explicitly agrees that by entering the SBNC Promotion, the sole prize for becoming a finalist in the SBNC Promotion is the Prize with the opportunity to win the Grand Prize. The winners of both the Prize, as applicable, must be able to fulfill the Requirements. A finalist's or winner's failure to fulfill the Requirements shall constitute a disclaimer by the finalist or winner of the Prize, or any other prize, compensation, or monetary value of any nature whatsoever associated with or otherwise related to the SBNC Promotion. HOTEL ACCOMMODATIONS: Once hotel accommodations have been confirmed, no changes will be allowed except by DraftKings or its designees. Hotel accommodations are subject to additional restrictions and requirements as set forth in the hotel agreement between of the hotel designated by DraftKings. All incidentals not mentioned within the Qualifier Prize details, including, without limitation, luggage fees, service charges or facility charges, personal charges, room services, minibar, incidentals, entertainment, damage to hotel room, security fees, gratuities, taxes or other expenses, are the sole responsibility of the Prize winner and his/her travel companion. AIRFARE: The winner of the Qualifier Prize shall be responsible for coordinating and booking his/her own transportation, transfers, and similar. DraftKings shall have no responsibility or liability for winner’s transportation, transfers, and similar except for providing the credit outlined above. The winner and his/her guest will be responsible for all airfare costs and fees in excess of the credit. INCIDENTAL EXPENSES: All other expenses and incidental travel costs not expressly stated in the SBNC Promotion Rules, including but not limited to, travel costs, meals, incidentals, passenger tariffs or duties, airline fees, surcharges, airport fees, luggage fees, service charges or facility charges, personal charges, damage to hotel room, security fees, gratuities, taxes or other expenses, including any transportation not mentioned within such Qualifier Prize description, including without limitation, transportation to and from airports and flights, are the sole responsibility of the Qualifier Prize winner and his/her travel companion. The Qualifier Prize winner and his/her travel companion are also responsible for obtaining travel insurance (and all other forms of insurance) at their option and hereby acknowledge that DraftKings has not and will not obtain or provide travel insurance or any other form of insurance. CONDUCT: The Contestant and his/her travel companion must follow all instructions of DraftKings or its designees relative to the Prize and any element thereof, in addition to the Requirements. In the event the Contestant or his/her travel companion engages in behavior that, as determined by DraftKings in its sole discretion, is obnoxious or threatening, illegal or that is intended to annoy, abuse, threaten or harass any other person, DraftKings reserves the right to terminate the Prize or other applicable experience early, in whole or in part, and send the Contestant and his/her travel companion home with no further compensation. In such event, the Contestant may also be required to reimburse the DraftKings for the ARV of the Prize. Participants in the SBNC understand and acknowledge that their wagers, once placed, shall be made public and displayed in conjunction with the operation of the SBNC to all Contestants on leaderboards and in any other way deemed appropriate by DraftKings for the duration of the Promotion, and in perpetuity as DraftKings deems fit. By entering the SBNC Promotion, each Contestant agrees to receive communications from DraftKings, subject to opting out when Entrant so desires. Entrant’s information will not be shared or sold to any outside party. Each player who enters the SBNC Promotion hereby agrees and consents, without further authorization, compensation or remuneration of any kind, to the editing, modification, replication, publication and/or other use of the names, likenesses, photographs, videos, voices, Entries and the like of the Entrant in any medium, whether now known or hereafter developed, including without limitation, any and all advertising, promotions, and other publicity conducted by DraftKings. Notwithstanding the generality of the foregoing, each Entrant further assigns any and all rights he or she may have over his or her Entry to the Sponsor without further authorization, compensation or remuneration of any kind. As used herein, a "Force Majeure" event shall mean the interruption of or material interference with DraftKings' ability to grant to hold the Promotion or to grant the Contestants the Prize by any cause or occurrence not within DraftKings' reasonable control, including, but not limited to, fire, flood, epidemic, earthquake, explosion, hurricane, terrorist threat or activity, public health emergency (e.g., SARS), act of God or public enemy, satellite or equipment failure, riot or civil disturbance, war (declared or undeclared), or any federal, state or local government law, order or regulation, or order of any court. In the event of a Force Majeure, DraftKings may reschedule the SBNC Promotion, or may cancel the SBNC Promotion altogether. DraftKings.com reserves the right to change or cancel this Promotion in its entirety at any time or exclude any individual(s) from participation, if it determines at is sole discretion there are any irregularities, fraudulent activities, or abuses occurring in connection with the SBNC or a Contestants’ entry. DraftKings reserves the right to alter these rules and event at any time in DraftKings' sole discretion upon reasonable notice to you; provided however that any change in the structure of the Prize shall be made prior to the beginning of the SBNC Promotion.